2. Comb all the hair to the back, away from the face. Note that we are working with clean, dry hair. Relatively long, thick hair is needed for this hairstyle. 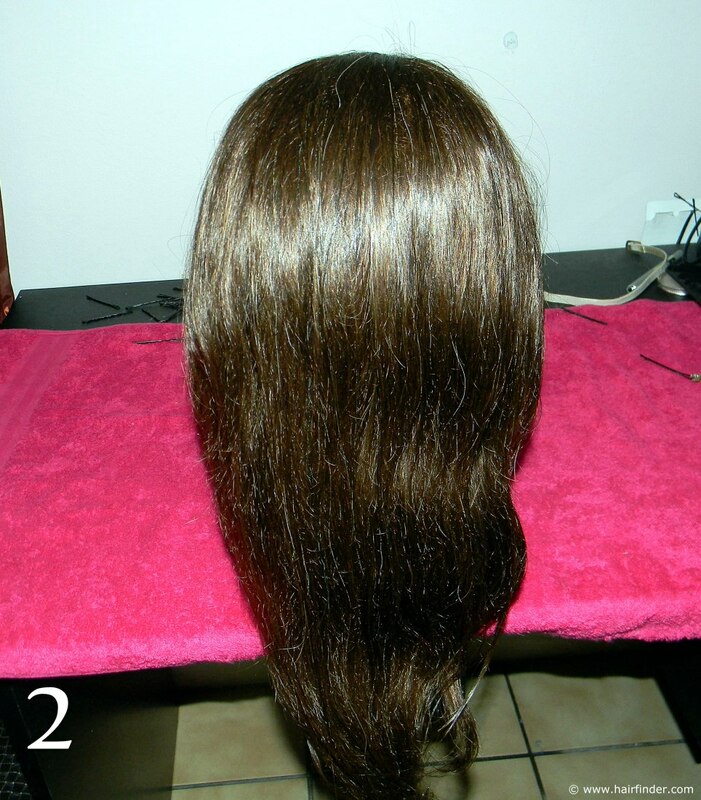 If you hair is not long enough, you can also do this style by using clip-in hair extensions. 3. 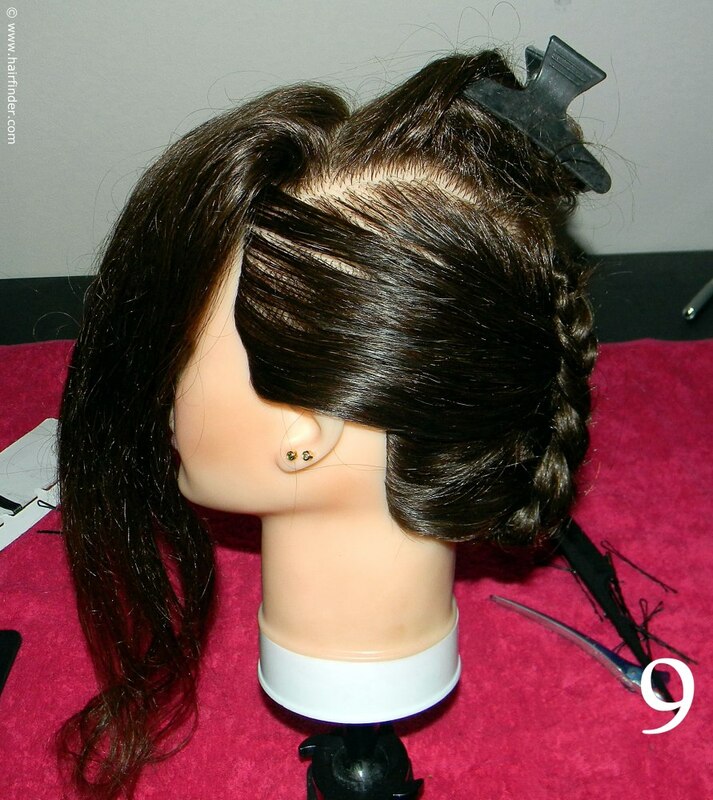 Use your tail comb and draw a block, in doing so sectioning off the part of hair that will systematically be styled into the faux pixie style in the front. 4. Note that the section spans from side-temple to side temple. It’s important that you leave yourself wide enough space for creating the faux pixie, especially from the front view. 6. 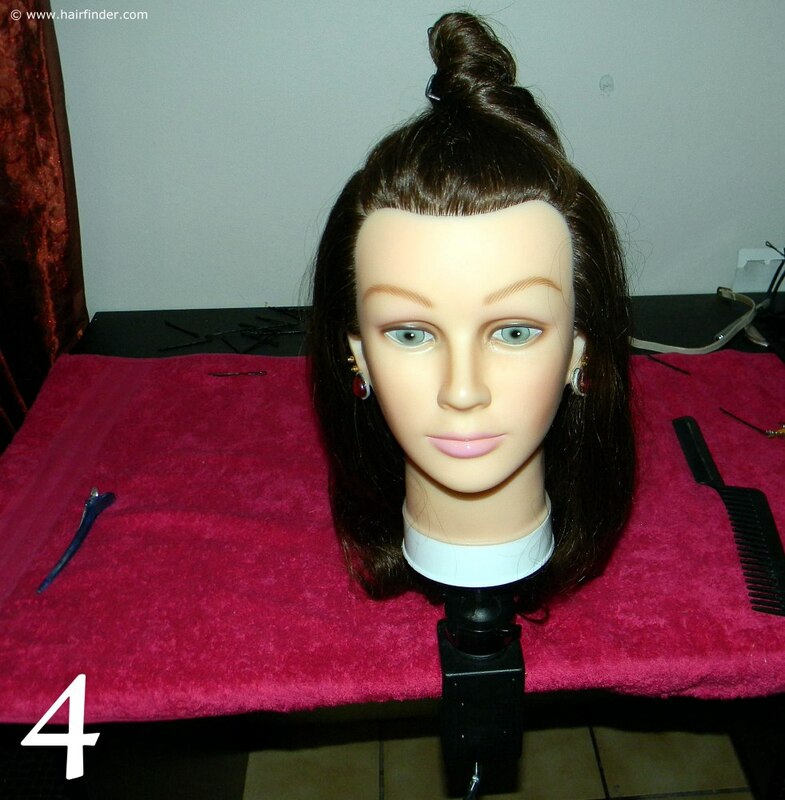 Do this at both sides of the head, in order to get the hair as neat and smooth as possible. 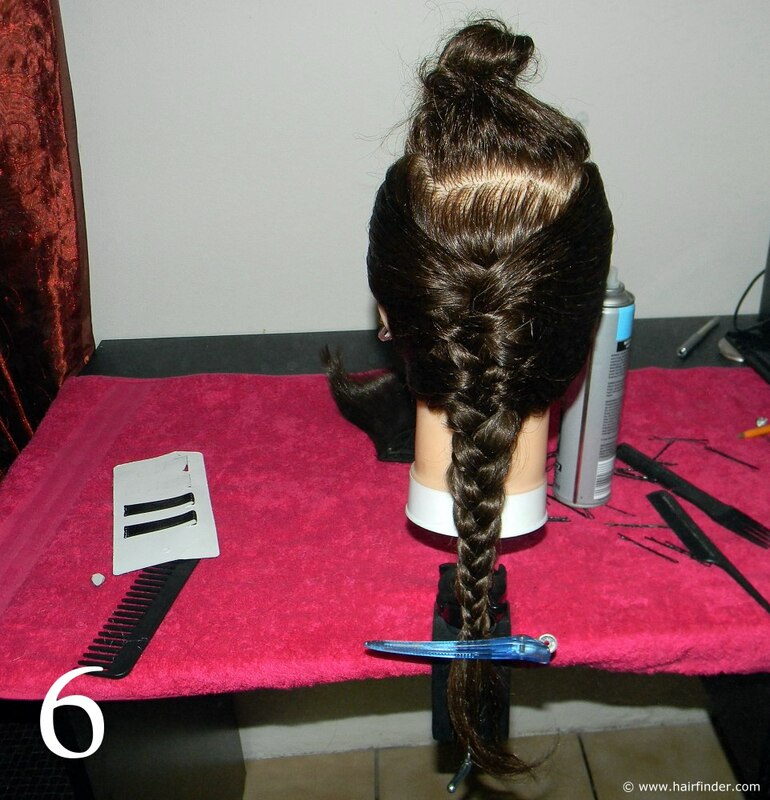 Then braid the hair in a simple three strand plait, all the way down in the length of the hair. 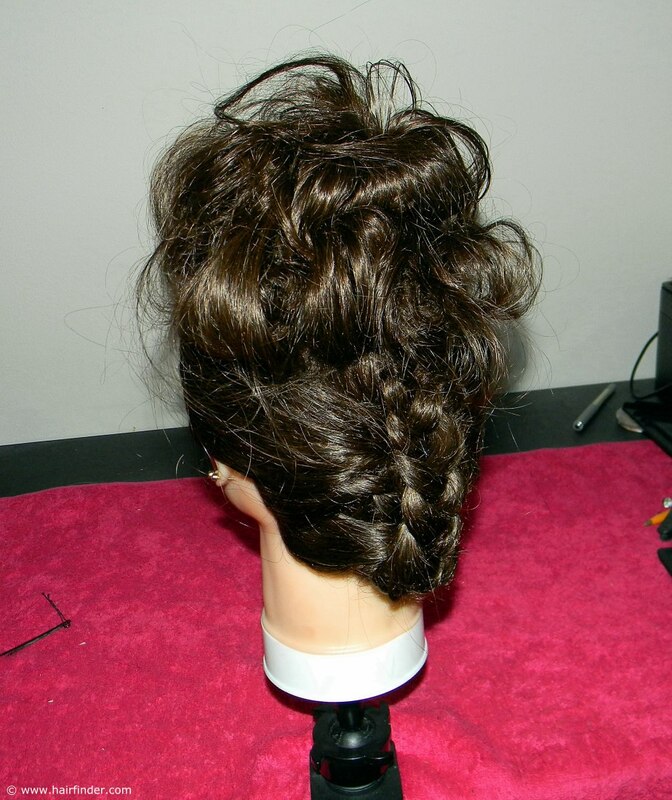 Note that the braid is tight and neat. Concentrate on your control and tension of the hair. 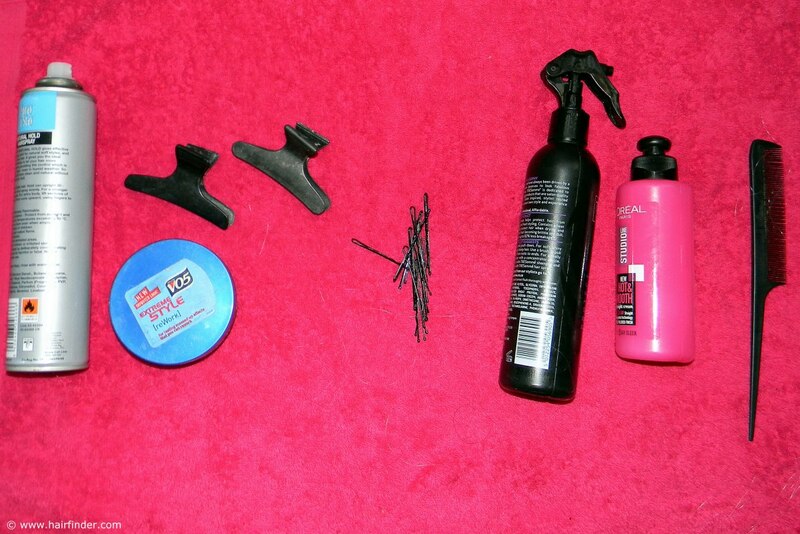 Continue to use your hairspray, to smooth down fly-away hair etc. 7. Secure the end of the braid with a crocodile-clip. 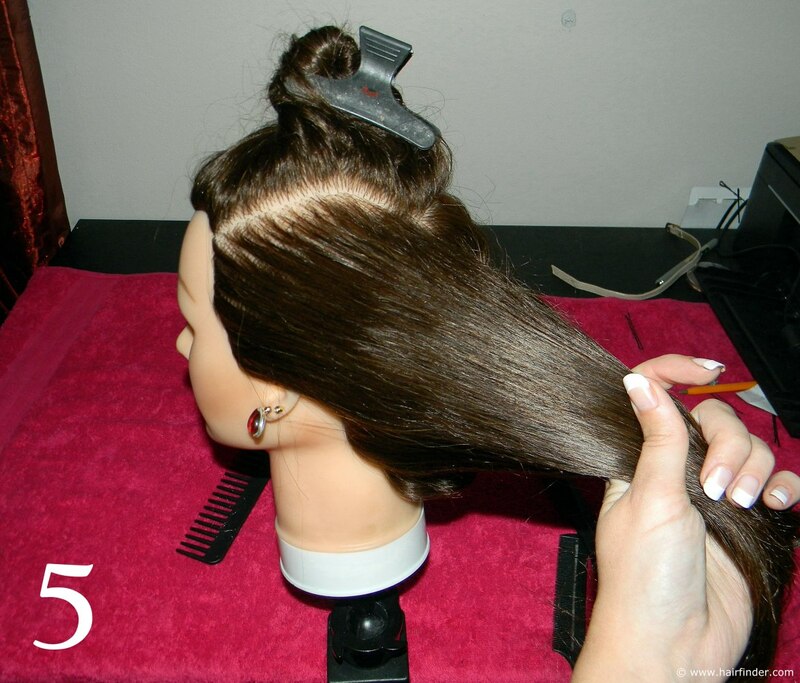 Note the large amount of hairspray used to produce the smooth, shiny surface of the hair on the sides of the model’s head. Use a thin-toothed comb to produce this look. 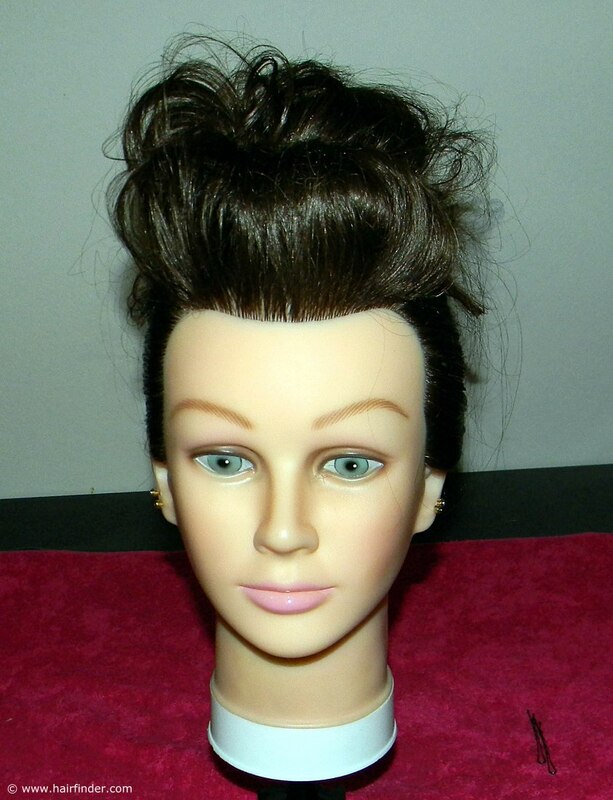 It’s paramount that the hair on the sides of her hair is as flat and smooth as possible against the scalp. 8. 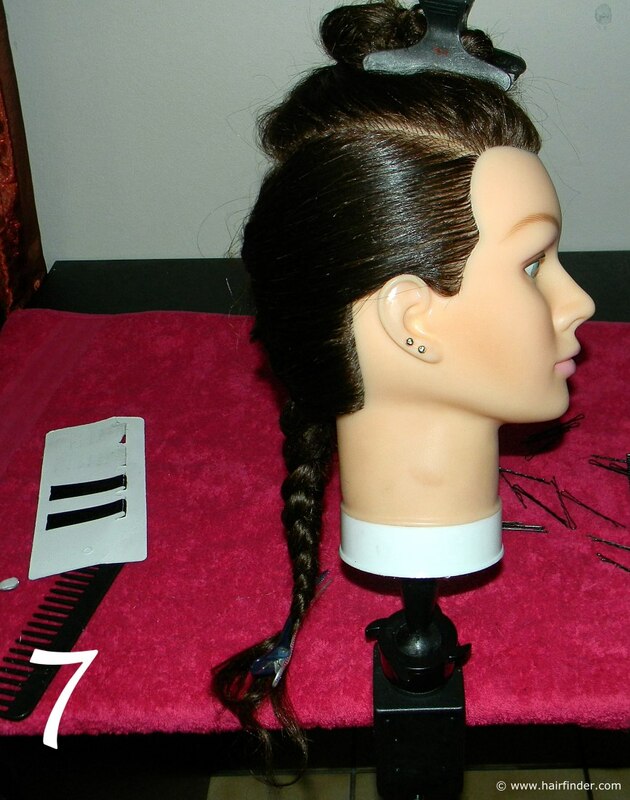 Flip the length of the braid in an upwards direction, and secure it with a bobby pin. 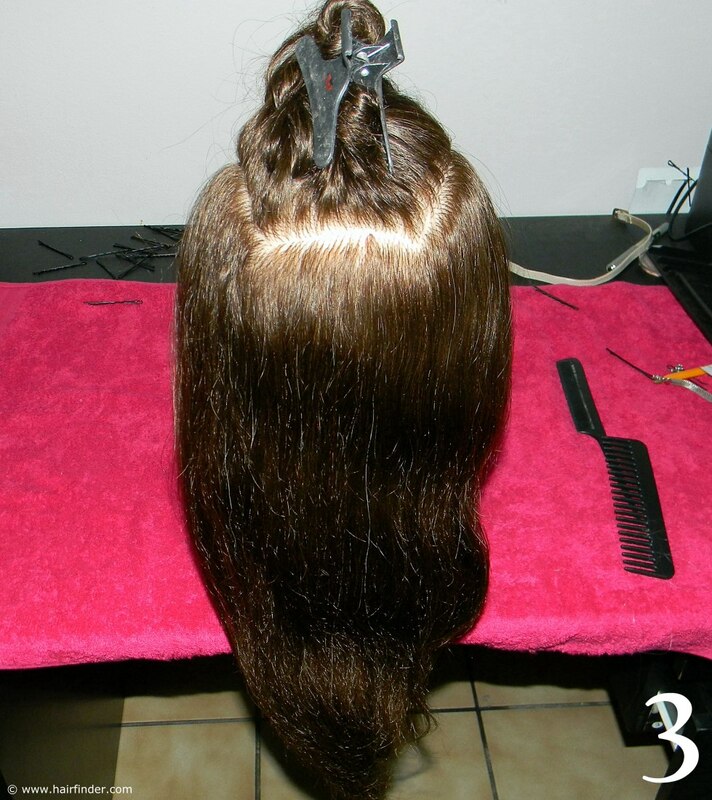 For dark hair use a black or brown pin, for blonde hair use a golden pin. 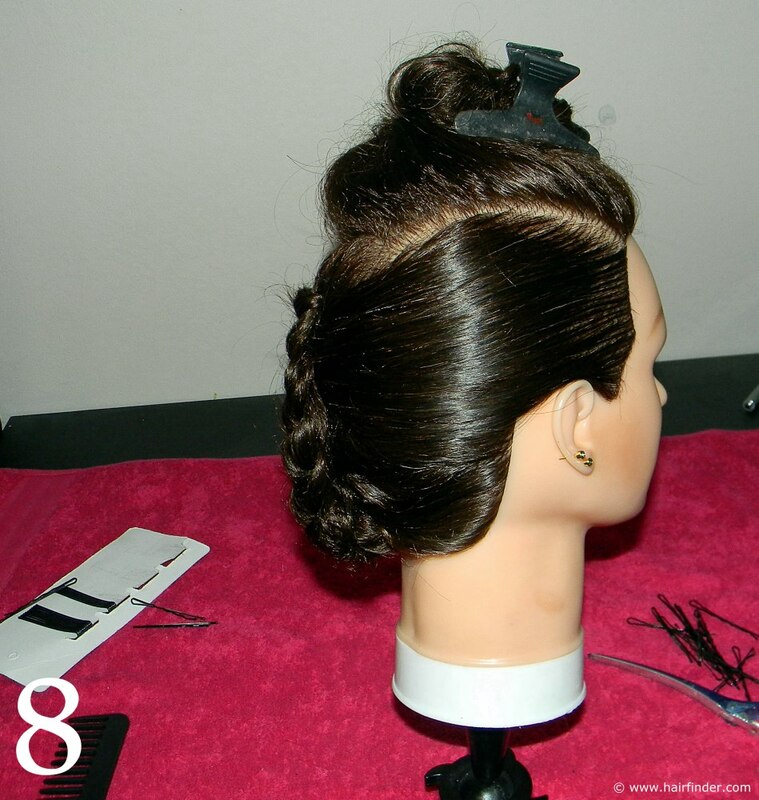 The goal is to insert the pin as neatly and inconspicuous as possible without disturbing the rest of the already styled hair.